One of my first jobs, after I graduated from art school, was with our local children’s museum. I was chosen to work in the art studio where I managed the projects that the education team thought up to reinforce the week’s theme and the museum’s mission of learning through play. Every day, I played with messy art supplies and enjoyed the company of incredibly enthusiastic toddlers and preschoolers. My time there came to a close the week before my Moose was born. On my last day, one of the educators gifted me with Beautiful Oops, an art book for children. 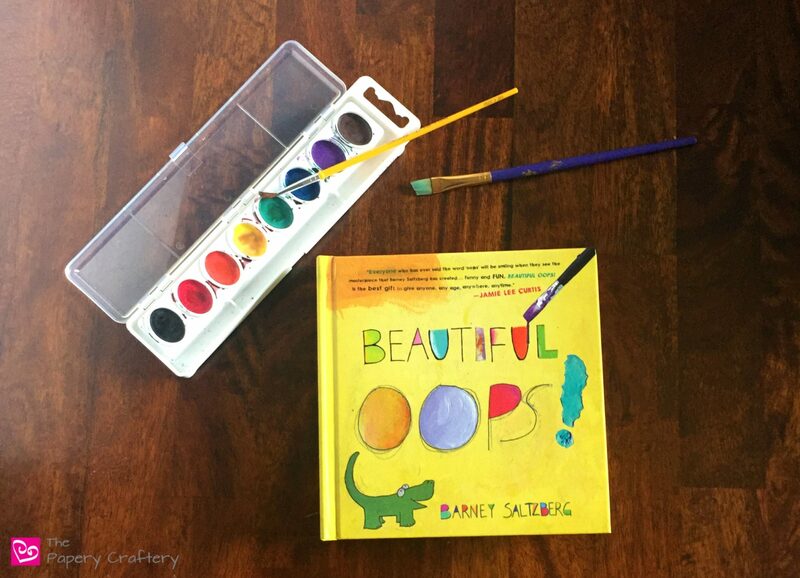 Beautiful Oops, written by Barney Saltzberg, is an award-winning book for kids (and adults!) full of spills and drips, tears and rips, all re-imagined into new creations. It’s all to show that there is no “ruined” artwork. There is only the opportunity to look at every blooper in a new way and ease children’s minds that they need to be perfect. I think there’s a great lesson there for all of us! This book is filled with amazing examples of creative problem-solving. On one page, Mr. Saltzberg demonstrates how a whoops of a spill can be turned into any number of new ideas with just a little imagination. My Moose really got into Beautiful Oops recently. He spent some time flipping through the pages, lifting the flaps and folds, and seeing all the ways Mr. Saltzberg changed his “mistakes”. This paper telescope page got a big “Wow!”. Even the Bean got into it after watching her brother read for a while. Now, my son isn’t much of a perfectionist when it comes to artwork. In fact, he generally gets an idea, rushes through it, and moves on to the next thing. But I knew he’d get a kick out of the way Beautiful Oops revamps the slip ups. Because that’s the way his mind works. He’s the one grabbing bits of paper and transforming them into his own unique creations. I swear, that boy is already so much more creative than his mama, even at 5. I’m really excited about the My Book of Beautiful Oops journal that follows up the original, too. We ran across it in a bookstore this week. I was blown away! Instead of having the oops already transformed, the journal just gives the prompts and it’s up to the reader to change them up. So much fun! I hope you’ll give Beautiful Oops a peek. It truly is an amazing resource to stretch those imagination muscles! And, if you have any art books for kids that you recommend, tell me all about it in the comments below! Bet they will be artsy in their own way. We have this book at home – it is great ! I love the message and I think it really pushes the creative thinking side of the brain! It’s true! If you get a chance, check out the journal that goes with it too. The creative prompts are really fantastic! I love it! I’m definitely getting this for my girls. Wonderful! Let me know what they think! I absolutely adore this book and so does my daughter. She loves anything art-related, and this book was super helpful in teaching her that when it comes to creating, everything is perfect (even if you think it’s not!). That’s awesome! I’m so glad your daughter loves it too! This book looks fun. My daughter loves art and would love this. I bet she would, April. It’s so fun! The art teacher (and good friend of mine) at the school I teach at uses this book for one of her art lessons each year. I LOVE it. The pop-ups do tend to get ripped pretty quickly in my house, but they’re really fun while they last! That sounds like such a great book! I’ll have to look into it! I hope you do, Danielle! I adore this! What a cute idea for kids! We have really been getting into journaling and painting, so this would be perfect for my girls. Sounds great! The creative prompts are really entertaining!